How do I work with raster data sets that are in different projections? Reproject a raster in R.
Sometimes we encounter raster datasets that do not “line up” when plotted or analyzed. Rasters that don’t line up are most often in different Coordinate Reference Systems (CRS). This episode explains how to deal with rasters in different, known CRSs. It will walk though reprojecting rasters in R using the projectRaster() function in the raster package. 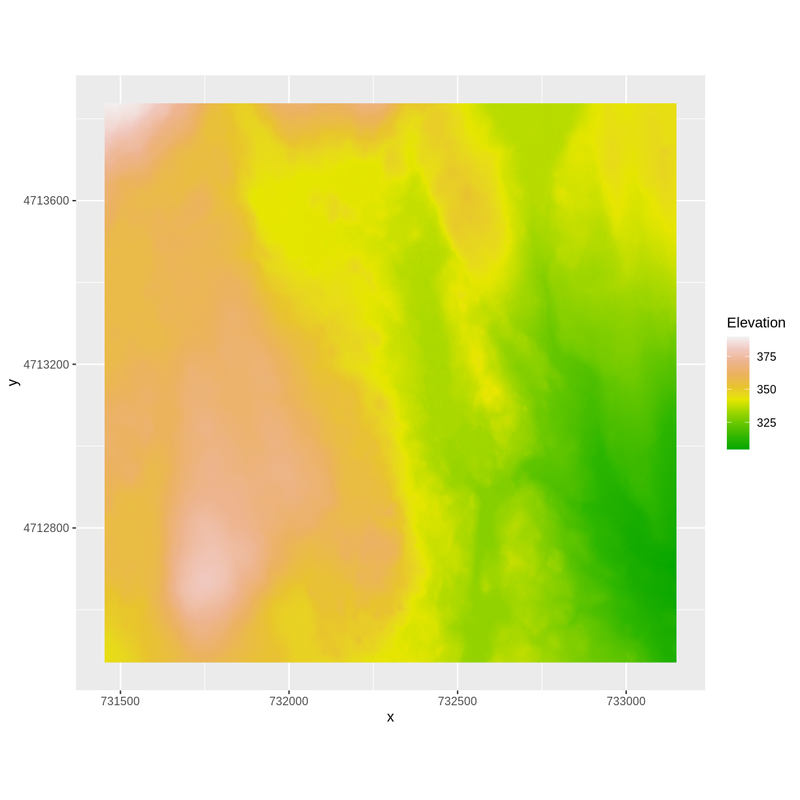 In the Plot Raster Data in R episode, we learned how to layer a raster file on top of a hillshade for a nice looking basemap. In that episode, all of our data were in the same CRS. What happens when things don’t line up? For this episode, we will be working with the Harvard Forest Digital Terrain Model data. 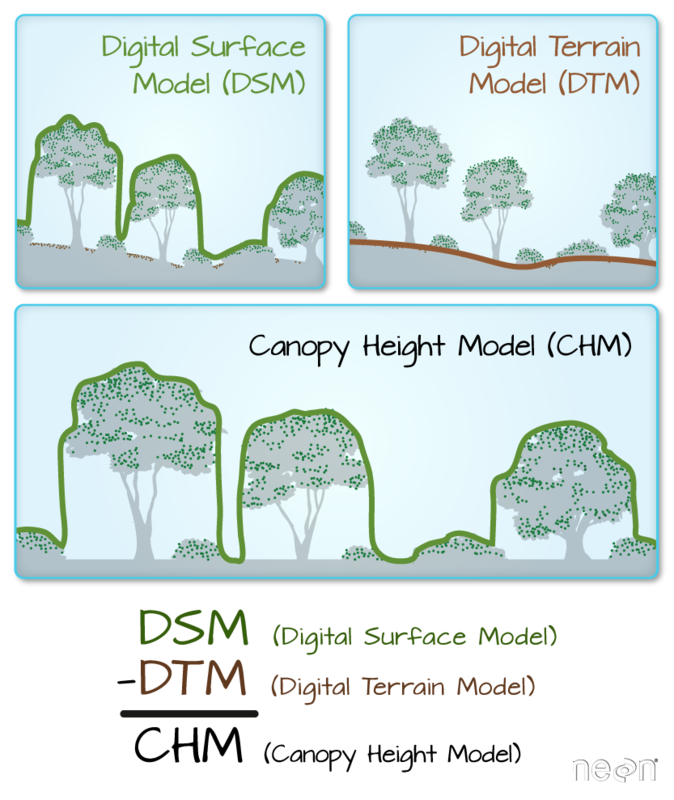 This differs from the surface model data we’ve been working with so far in that the digital terrain model (DTM) includes the tops of trees, while the digital surface model (DSM) shows the ground level. We’ll be looking at another model (the canopy height model) in a later episode and will see how to calculate the CHM from the DSM and DTM. 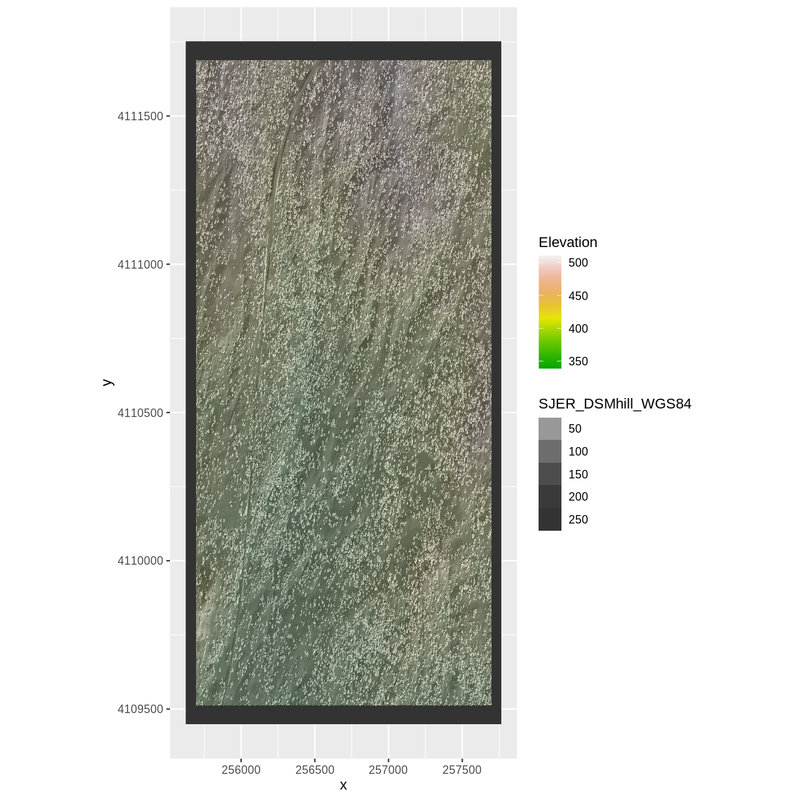 Here, we will create a map of the Harvard Forest Digital Terrain Model (DTM_HARV) draped or layered on top of the hillshade (DTM_hill_HARV). First, we need to import the DTM and DTM hillshade data. Next, we will convert each of these datasets to a dataframe for plotting with ggplot. Now we can create a map of the DTM layered over the hillshade. 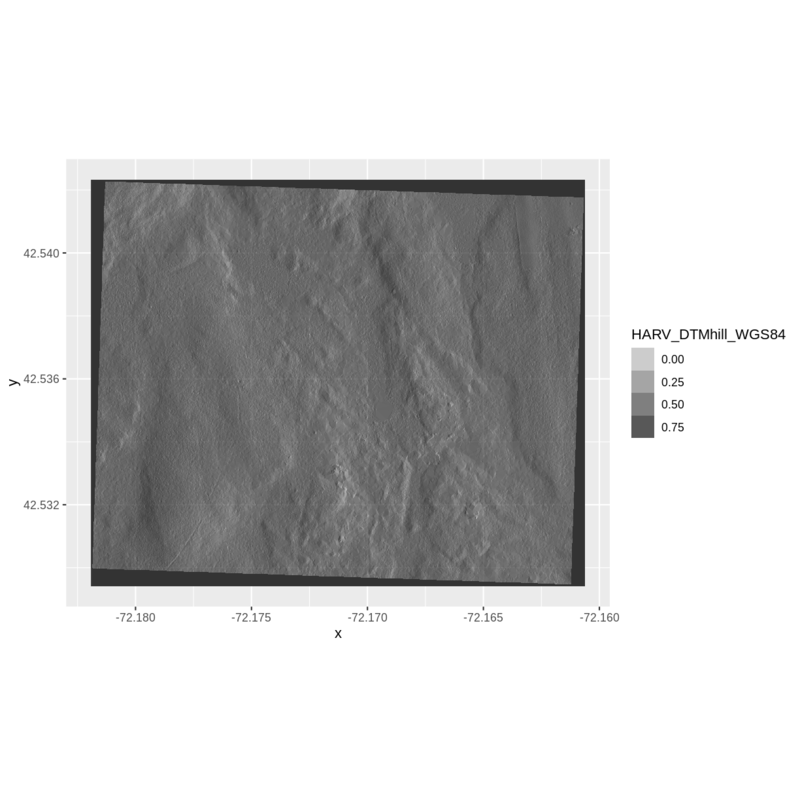 Our results are curious - neither the Digital Terrain Model (DTM_HARV_df) nor the DTM Hillshade (DTM_hill_HARV_df) plotted. Let’s try to plot the DTM on its own to make sure there are data there. Our DTM seems to contain data and plots just fine. Next we plot the DTM Hillshade on its own to see whether everything is OK. If we look at the axes, we can see that the projections of the two rasters are different. When this is the case, ggplot won’t render the image. It won’t even throw an error message to tell you something has gone wrong. We can look at Coordinate Reference Systems (CRSs) of the DTM and the hillshade data to see how they differ. View the CRS for each of these two datasets. What projection does each use? DTM_HARV is in the UTM projection, with units of meters. DTM_hill_HARV is in Geographic WGS84 - which is represented by latitude and longitude values. Because the two rasters are in different CRSs, they don’t line up when plotted in R. We need to reproject (or change the projection of) DTM_hill_HARV into the UTM CRS. Alternatively, we could reproject DTM_HARV into WGS84. We can use the projectRaster() function to reproject a raster into a new CRS. Keep in mind that reprojection only works when you first have a defined CRS for the raster object that you want to reproject. It cannot be used if no CRS is defined. Lucky for us, the DTM_hill_HARV has a defined CRS. When we reproject a raster, we move it from one “grid” to another. Thus, we are modifying the data! Keep this in mind as we work with raster data. the CRS that we want to reproject it to. We want the CRS of our hillshade to match the DTM_HARV raster. We can thus assign the CRS of our DTM_HARV to our hillshade within the projectRaster() function as follows: crs = crs(DTM_HARV). Note that we are using the projectRaster() function on the raster object, not the data.frame() we use for plotting with ggplot. 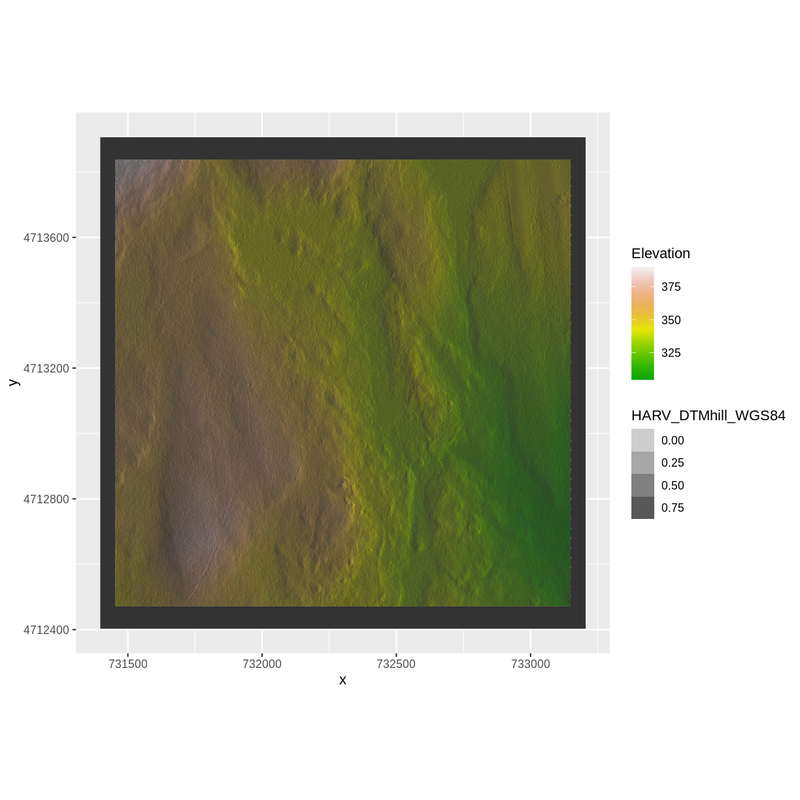 Now we can compare the CRS of our original DTM hillshade and our new DTM hillshade, to see how they are different. We can also compare the extent of the two objects. Notice in the output above that the crs() of DTM_hill_UTMZ18N_HARV is now UTM. However, the extent values of DTM_hillUTMZ18N_HARV are different from DTM_hill_HARV. Why do you think the two extents differ? The extent for DTM_hill_UTMZ18N_HARV is in UTMs so the extent is in meters. The extent for DTM_hill_HARV is in lat/long so the extent is expressed in decimal degrees. Let’s next have a look at the resolution of our reprojected hillshade versus our original data. These two resolutions are different, but they’re representing the same data. We can tell R to force our newly reprojected raster to be 1m x 1m resolution by adding a line of code (res=) within the projectRaster() function. Now both our resolutions and our CRSs match, so we can plot these two data sets together. 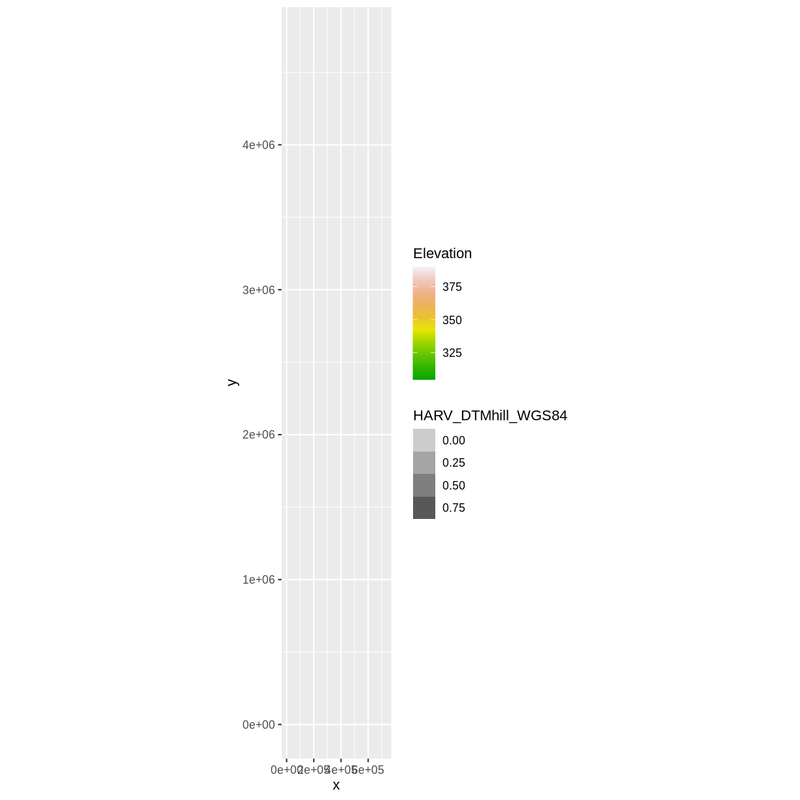 For plotting with ggplot(), we will need to create a dataframe from our newly reprojected raster. We can now create a plot of this data. We have now successfully draped the Digital Terrain Model on top of our hillshade to produce a nice looking, textured map! Create a map of the San Joaquin Experimental Range field site using the SJER_DSMhill_WGS84.tif and SJER_dsmCrop.tif files. Reproject the data as necessary to make things line up! If you completed the San Joaquin plotting challenge in the Plot Raster Data in R episode, how does the map you just created compare to that map? The maps look identical. Which is what they should be as the only difference is this one was reprojected from WGS84 to UTM prior to plotting.